For all serious and extensive burns (over 20 percent BSA), and in the presence of shock, start intravenous therapy with an electrolyte solution (Ringers lactate) in an unburned area. Maintain intravenous treatment during transportation. Relieve mild pain with aspirin. Relieve moderate pain with cool wet compresses or ice water immersion (for burns of less than 20 percent BSA). Severe pain may be relieved with morphine or demerol injections. Pain resulting from small burns may be relieved with an anesthetic ointment if the skin is not broken. Continue to observe for airway patency, hemorrhage, and shock. Continue intravenous therapy that is in place, or start a new one under a medical officers supervision to control shock and replace fluid loss. Shave body hair well back from the burned area and then cleanse the area gently with disinfectant soap and warm water. Remove dirt, grease, and nonviable tissue. Apply a sterile dressing of dry gauze. Place bulky dressings around the burned parts to absorb serous exudate. All major burn victims should be given a booster dose of tetanus toxoid to guard against infection. Administration of antibiotics may be directed by a medical officer. If evacuation to a definitive care facility will be delayed for 2 to 3 days, start topical antibiotic chemotherapy after the patient stabilizes and following debridement and wound care. Gently spread a 1/16-inch thickness of Sulfamylon or Silvadene over the burn area. Repeat the application after 12 hours, and then after daily debridement. Treat minor skin reactions with antihistamines. Sunburn results from prolonged exposure to the ultraviolet rays of the sun. 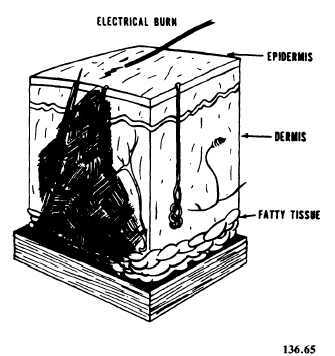 First and second-degree burns similar to thermal burns result. Treatment is essentially the same as that outlined for thermal burns. Unless a major percentage of the body surface is affected, the victim will not require more than first aid attention. Commercially prepared sunburn lotions and ointments may be used. Prevention through education and the proper use of sun screens is the best way to avoid this condition.